Replacement D-handles are sold in pairs to make shipping of an online purchase more worthwhile. Super tough handle. 9" tall x 5" wide, with a rubber grip. Fits on standard 1.25" diameter shafts. Short and smaller grip diameter. 7.5" tall x 4" wide, with a rubber grip. Fits on standard 1.25" diameter shafts. Better for making a short shovel. Short gripless D-handle and smaller grip diameter . 7.5" tall x 4.5" wide. Fits on standard 1.25" diameter shafts. Better for making a short shovel. Ergo D-handle. 6.5" tall x 4.5" wide, with a rubber grip. Fits on 2014 model shovels. This handle does not easily fit most shafts as it is about 1.2". 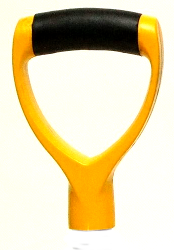 Seen here on a traditional blade, the staff handle makes the perfect all terrain shovel. A staff is more forgiving in rocky ground than D & e grip type shovels, and it provides greater leverage when needed for tougher ground. Seen here with the super tough Brute D-handle, this tapered shaft fits all blades. Some tweaking may be required. Choose from 4 grip styles and 10 sizes. D-handle and straight wood shaft. Fits blades that require straight shaft, and can be shaped to fit other blades also. Choose from 4 grip styles and 10 sizes.